Posted on September 23, 2015 at 3:23 pm. Guts Casino is a premiere online destination for live dealer gaming and to celebrate the impending milestone of the 125,000th spin to be placed at a Guts live dealer roulette table, Guts is giving players the chance to win a share of $2,500 in prizes. Winners will be drawn at random at the end of the promotional period upon the 125,000th live roulette spin. You’ll also keep any roulette winnings you make along the way so this is your chance to really boost your cash rewards. 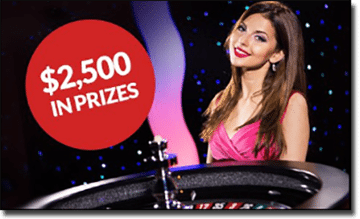 We don’t often see roulette promotions at our recommended casinos and live dealer promos are particularly rare, so don’t delay as the 125,000th spin could be placed any moment. Like most live dealer games, free play isn’t allowed so you’ll need a real money account to join in on this exciting promotion. New members signing up for an account with Guts will receive a $400 welcome bonus and 100 free spins when following our links to join. If you already have an account at Guts, deposit some funds and get spinning! The live dealer portfolio at Guts is one of the most impressive you’ll find at a reputable casino, with multiple roulette tables operating at any given time including classic roulette, Immersive Roulette, VIP Roulette and Auto-Roulette. To break things up between roulette spins there is also live blackjack, live baccarat, live Casino Hold’em and live Three Card Poker. Sign up for an account with www.Guts.com today and receive $400 in matched deposit bonuses and 100 free spins on Starburst pokies.